25 Years Ago: Dunstall 17 Goals 25 years ago this week, Jason Dunstall booted 17 goals against Richmond. But there is a catch... we cannot find the vision! Dunstall's 17-goal haul is the second most by an individual player in any one match. This round marks the 25th anniversary of one of the greatest individual Hawthorn performances. 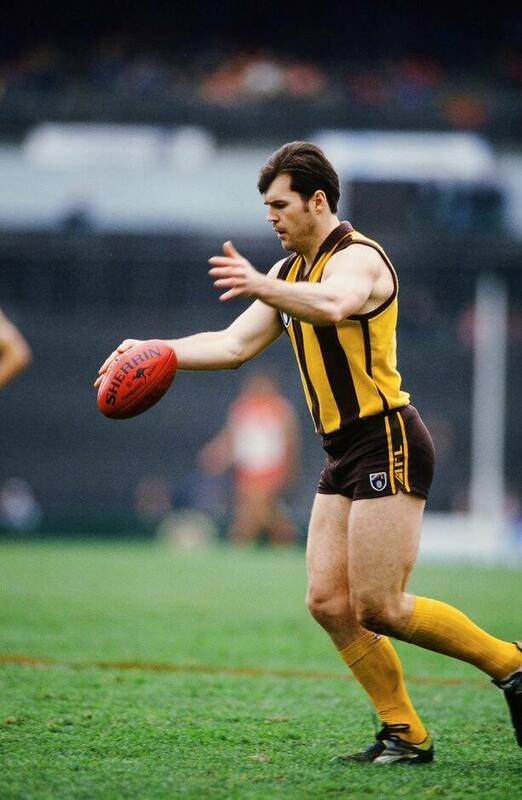 In Round 7 1992, Jason Dunstall kicked 17 goals against Richmond, falling just one short of Fred Fanning’s VFL-AFL record of 18, but bettering the previous Hawthorn record of 16 set by Peter Hudson in 1969. A Waverley Park crowd of 26,789 saw Dunstall kick 6 in the first quarter, 5 in the second, 2 in the third and 4 in the last. By the end of the game, his 17 goals 5 behinds were part of a team score of 25.22.172, which easily accounted for Richmond’s 14.9.93. There were occasions late in the game when Richmond had three players on Dunstall and, in one instance Dean Anderson, desperately looking to pass to Dunstall to give him an opportunity to kick an 18th, instead had to shoot himself. When the teams met again in Round 22, Dunstall booted a further 12 goals, making a total of 29 versus the Tigers in 1992. Before last Saturday, the last time Hawthorn lost to St Kilda by 75 points was back in Round 19 1992. After that heavy defeat to the Saints at Waverley Park, the Hawks went to the MCG the following week in Round 20 to play Essendon and remarkably won by 160 points, a 235 point turnaround in just one week! Shaun Burgoyne is due to play his 90th consecutive game on Sunday. This puts him in rare company at Hawthorn with only a handful of players having played more games in a row, headed by Andrew Collins (189), Michael Tuck (138) and Kelvin Moore (128). One other current Hawk, Luke Breust, played 92 consecutive games from 2012 to 2015. Isaac Smith will play his 50th consecutive game this week. Hawthorn has the opportunity to square its Round 7 ledger when it takes on Melbourne. Currently, the Hawks’ Round 7 record is 45 wins, 46 losses and one draw. Hawthorn has won its last six Round 7 games, including wins against Melbourne in both 2012 and 2015. Like this decade, the 1970s brought much Round 7 happiness - the Hawks won eight consecutive Round 7 matches from 1971 to 1978. Hawthorn had won 13 consecutive games against Melbourne until the Demons broke through for a win in Round 20 last season. Prior to that defeat, the Hawks’ last loss to Melbourne was back in 2006. In the sequence of 13 wins there were two victories by over 100 (in 2008 and 2015) and seven by over 50 points, while the narrowest winning margin was 19 points. Hawthorn’s best sequence of wins against any opponent is the 22 consecutive it racked up against Melbourne from 1973 to 1984. That sequence only included one win by over 100 (in 1983) and it also included a number of narrow victories with eight of the 22 games being won by 18 points or fewer. Overall, Hawthorn and Melbourne have played each other 160 times, with the Hawks winning 85 and the Demons 75. This Sunday, Jordan Lewis will become the player to have played the most games for Hawthorn and then play against the club. Lewis played 264 games for Hawthorn which has him at equal 11th position with Peter Knights on the career games list. Lewis assumes the mantle from Rodney Eade who after playing 229 games for the Hawks (1976-87), then played 30 for the Brisbane Bears (1988-90) including three against his former club. Other Hawthorn 200 gamers to have subsequently played against the club are Alan Martello, Mark Graham and Geoff Ablett. Obviously, Sam Mitchell may join this list at some stage. 40 years, in Round 7 1977, the Hawks eventually put the inaccuracy of the previous week behind them to kick 20.11.131 and beat Footscray 8.13.61 by 70 points. The inaccuracy carried into the opening term with the Hawks managing 4.7, but keeping the Bulldogs scoreless. After quarter time Hawthorn went to the other extreme kicking a very accurate 16.4. In Don Scott’s absence, Alan Martello was outstanding in the ruck getting almost as many hit outs as Footscray champion Gary Dempsey and taking a game-high 12 marks and having a game-high 22 kicks. Unfortunately, Martello was also reported and received a two-match suspension at the tribunal. Other good players included forwards Peter Hudson (6 goals) and John Hendrie (5), defenders Kelvin Moore and Michael Moncrieff, and on-ballers Michael Tuck, Leigh Matthews and Alan Goad. Ten years earlier, in Round 7 1967, Peter Hudson played in a winning Hawthorn team for the first time. The Hawks’ opponent Fitzroy had moved from Brunswick Street to share Princes Park from the start of the 1967 and for Hawthorn it was a second visit for the season, having lost to Carlton there in Hudson’s debut in Round 2. Hawthorn defeated Fitzroy by 44 points – 16.14.100 to 9.12.66. Hudson kicked seven goals and Peter Crimmins four, while other good players included Rod Olsson, Ray Wilson, Des Meagher and Mike Porter. Fitzroy’s ground move was not proving popular with fans as just 7,608 attended the game. The leading individual goalkicker for Hawthorn against Melbourne is Peter Hudson who booted 16 goals at Glenferrie in Round 5 1969.